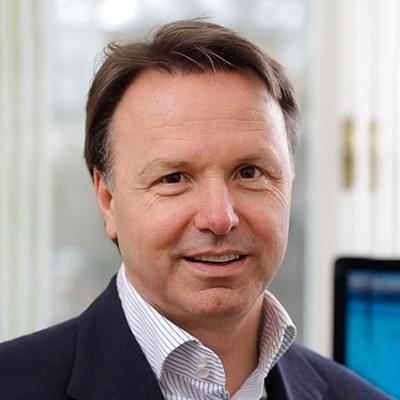 The Very First AI Mobile CRM by Nikolaus Kimla - SalesPOP! 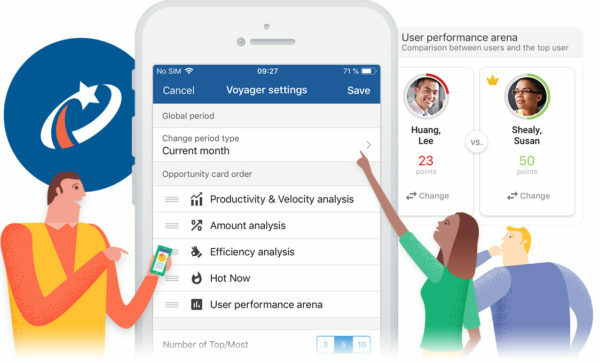 Voyager has arrived—empowering you with the very first Artificial Intelligence functionality for Mobile CRM. It’s one thing to have statistics and numbers. But to interpret statistics requires intelligence, which is what we are providing with Voyager. 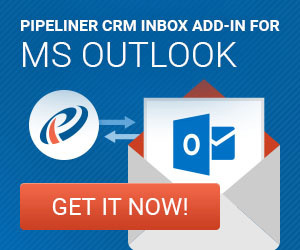 Want to know how well you or your team are doing compared to the last sales period? Want to see how you or your team have improved or are suffering with regard to opportunities? Lead count? Or accounts and contacts? It’s all here—brought to you by Voyager AI, utilizing Pipeliner’s instant dynamic visualization. Productivity—Shows you a comparison, as a ratio, of the current number of opportunities that have been won, as compared with the previous period, for a salesperson or team. Velocity—Shows the speed at which a salesperson or team is winning opportunities, as compared with the previous period. Winning Percentage—This metric compares a salesperson’s or sales team’s revenue from opportunities to the previous period. Efficiency—Shows how efficient a salesperson or team is, as compared to the previous period. Red=Negative—something needs to be handled. Green=Positive—the salesperson or team is doing better! You can view the “quick status” for opportunities, which gives you an instant, color-coded graphic of the above data. From these views, you can “drill down” to gain more granular insights. 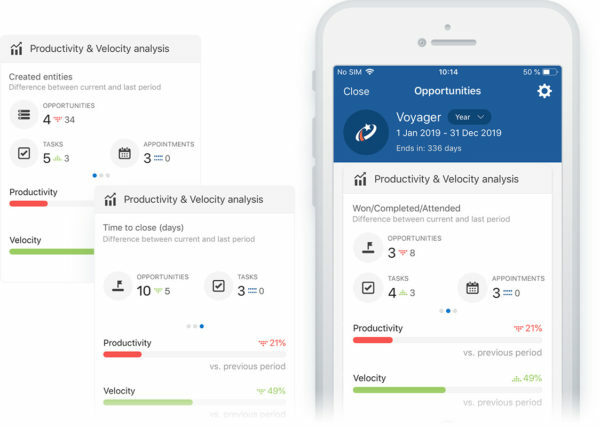 From both Productivity and Velocity, drill down to the Productivity and Velocity Analysis, where you can see the number of opportunities, tasks, and appointments created within a time period, and view instant comparisons to the last sales cycle. From Winning Percentage, drill down to the Amount Analysis, which shows both won amount and lost amount in revenue, and compares to the previous sales cycle. 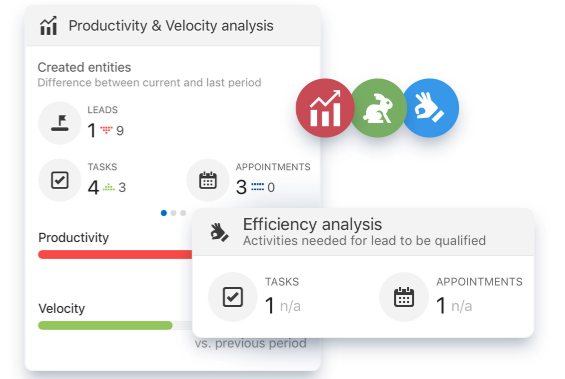 From Efficiency, drill down to the Efficiency Analysis, which shows you, in comparison to the last sales period, the degree of efficiency in relationship to tasks and appointments. Each of these analyses provides several different graphical methods with which to view the data. 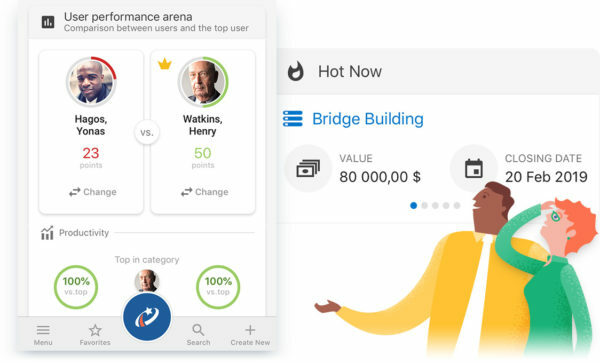 This totally unique feature allows you to compare user performance, one with another. For opportunities, you also have a “Hot Now” window which shows your hottest deals and their close dates. Know where to put your priorities. Productivity—Showing how quickly a salesperson or a team is qualifying leads and completing tasks, as compared with the previous sales period. Velocity—Shows how fast a user or a team is qualifying leads and completing tasks. Efficiency—Shows how much (or how little) effort goes into qualifying a lead. For leads, the “quick status” allows you to view these three metrics all on one screen, color-coded for instant comprehension. As with opportunities, you can drill down into analyses from each of these metrics for a more granular look at the data. The view for Accounts and Contacts is Winning Percentage, which compares a salesperson’s a sales team’s revenue from opportunities to the previous period. The Quick Status shows you an instant, color-coded graphic. 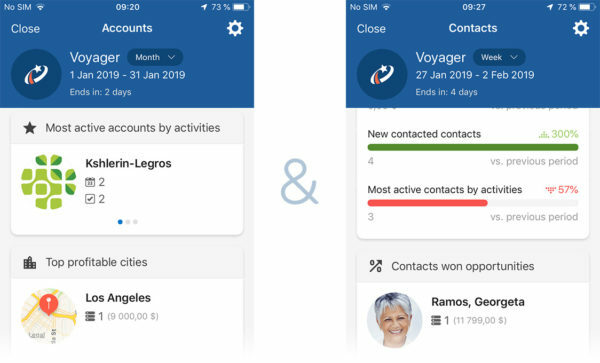 You can drill down to the Winning Percentage analysis, which will provide more granular insights into a salespersons’s or sales team’s performance as regards to accounts and contacts. Reach for the stars! 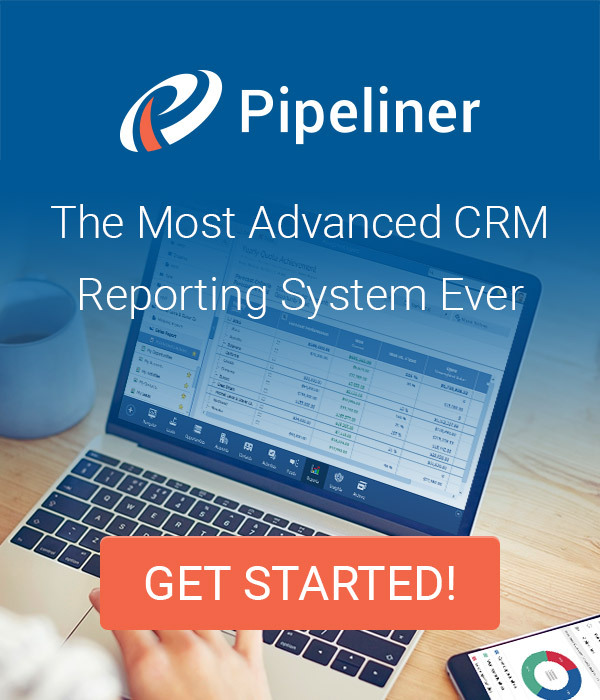 Put Pipeliner Voyager AI for Mobile CRM to work for your sales team today.